U.K.-based activists aligned with the Labour Party are lobbying House minority leader Nancy Pelosi to support nationwide, single-payer health care across the United States. The cofounder of Momentum, a hard-left political group born out of the election of U.K. opposition leader Jeremy Corbyn, announced plans Tuesday to organize a phone bank in London, where activists will call Americans in California's 12th Congressional District to urge them to support "Medicare for All." 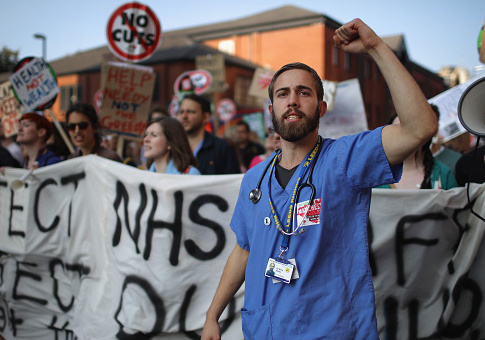 "I'm going to be hosting a phone bank next Wednesday, the 3rd, in my house in Tottenham in London and I'll make some cakes," Emma Rees said in a video posted to twitter by National Nurses United, the largest union of registered nurses in the United States. Emma Rees, a @PeoplesMomentum founder, shares the details of the phonebank she has planned. Rees's event appears to be part of a coordinated campaign across the U.K. to pressure Pelosi to back universal, single-payer health care. Several activists shared plans to host similar events during the 2018 Labour Conference in Liverpool. Bonnie Castillo, the executive director of National Nurses United, posted videos to twitter showing U.K. activists pledging to host phone banks across the country "to help people in the USA" achieve the passage of Sen. Bernie Sanders's (I., Vt.) Medicare For All Act. The proposal would see the rollout of Medicare coverage to all Americans regardless of age. "Activists will share their stories of why they love their health care system, the NHS [National Health Service], as we fight for a health care system in the USA that cares for everyone!" Castillo wrote in one tweet. A study released last month by the libertarian Mercatus Center at George Mason University found that Sanders's Medicare for All proposal would cost the government more than $32 trillion over 10 years. Pelosi has not endorsed the plan but recently said it should be "evaluated" if Democrats win the House in November. This entry was posted in Issues and tagged Democrats, Medicare, Nancy Pelosi. Bookmark the permalink.